The Sophia jewelry box offers classic contemporary design with a mahogany satin finish and cream velvet linings. This three drawer jewelry box comes with 29 jewelry compartments with 4 ring bars in top well of the chest. Accented with brushed nickel drawer pulls. Lift the cover to reveal 7 pendant hooks with catch shelf and magnetic fold down flap. 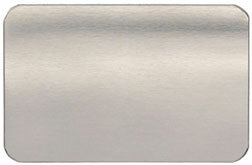 Optional brushed silver engraved plate (sent separate) attaches to top center of jewelry box cover. Jewelry box measures: 13 1/2" wide x 11 1/2" deep x 10 1/2" high. Weight 7 lbs. Product code 665MC. Click the button below to add the Sophia Mahogany Jewelry Box to your wish list.